When my children were young I use to sign them up for many different interactive and educational camps. I recall waiting on a long line to get a “slot” for the AMERICAN GIRL doll camp being offered through our local parks and recreation center. From sports to creative art camps my kids sampled them all. Most of the time they were fun and no complaints were heard. 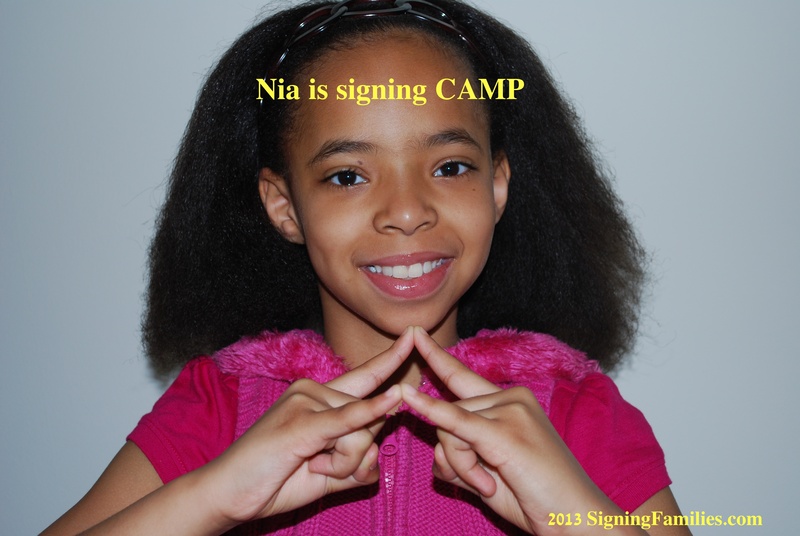 It is because I think learning at any age should be FUN and INTERACTIVE that I am offering this summer via my company SIGNING FAMILIES an online LIVE sign language “camp”. This will be for kids and their families to learn the basics of sign language as an “online summer camp program”. The online camp dates now available are the week of June 17th or the week of June 24th. If there is great interest then more online camp dates will be added. All you would need to do is have the ability for video chat online. We will most likely use SKYPE or a comparable system such as GOOGLE HANGOUT. The class will have up to 9 students involved which will make for great conversation and practice. Each student also will have an extra 60 minutes during the week for one on one questions and practice. DO WE GET ANY MATERIALS? In addition, each person who signs up will get our SIGNING FAMILIES ASL FOLDER, ASL POSTER and one DVD from our catalog (either Baby, Toddler and Preschool Sign Language or Sign Language for Emergency Situations). WHAT WILL THE ONLINE CAMP COVER? If you are interested in learning more about the camp or to sign up as an EARLY BIRD.. please comment below or connect via the FACEBOOK post, too. Once confirmed that you are signing up for a camp session you will be invoiced via PayPal. A non-refundable down payment of $25 reserves your spot. Down payment must be received within one week of signing up. Payment in full will be required by June 1, 2013. WILL YOU OFFER INDIVIDUAL SESSIONS FOR THOSE WHO WANT ANOTHER OPTION TO LEARN? Yes, I offer 30 minute SKYPE sign language lessons or tutoring. The rates are $20 per session. No materials are included in this price. Adults and children may request individual sessions. I also welcome families with children who have special learning challenges and need adaptive sign language. We are sorry that this offer is for US residents only. I think this is an awesome concept, I have taken ASL on and off for a few years. This camp is just for school age children correct? Actually this camp can be for ANY age.. I teach people of ALL ages and needs!